Residing in Florida since 1989, Yves established " Yves Fine Paintings & Trompe L’Oeil " in 1990. His unique technique and designs have grown to be unsurpassed in quality, excellence and originality. 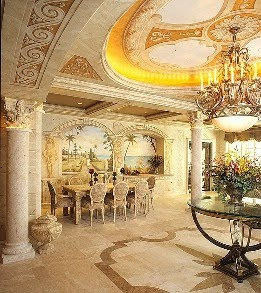 In the past few years, the growing demand for his work has allowed him to create large oil paintings, elaborate staircase settings, along with "Trompe L’Oeil" embracing the ceilings and walls of the living areas in numerous East Coast mansions. His commissions include, Fisher Island, Star Island, Indian Creek, Manalapan, Palm Beach estates and Celine Dion’s estate in Jupiter, Florida. Yves versatility in style comes from a mix of the Old World with surrealist, fantastical, mystical and utterly serene. His artwork and design has won multiple awards and is recognized by the art industry as one of the leading original Artists. Yves Lanthier has been profiled in numerous publications including Florida Design, Art Business News, Palm Beach Illustrated, Boca Raton News and named one of the World’s Best Trompe L’Oeil Artists. Yves is a completely self-taught artist, who discovered his gift at a very young age. "It all started in the first grade," he says. During a drawing class, an assignment was given to sketch a person that the students liked. "Without any thought, I moved to the front of the class and started drawing my teacher, portrait style. do you know why he changed from sketching to trompe l'oeil?